When I purchased an Apple Watch I was more interested in seeing notifications from my phone than I was the Watch’s activity feature. Sure. I’d probably try them out, but I’ve been a FitBit user for years, and didn’t see the Apple Watch as really something that could provide me with a much different experience as far as tracking runs and walks, my primary workout choices. Now after a few months I’ve found the Activity and Workout apps on the Watch to be two of my favorite Apple Watch features. I’m still wearing my FitBit everyday, but I tend to focus more on the readings I’m getting from the Watch than I am my FitBit. Here are a few things I’ve learned from using the two side-by-side for a few months. One of the biggest revelations I think I’ve had over the past few months is that all those “Active Minutes” I’ve been so proud of with my FitBit aren’t actually all that active. My workouts are predominantly long dog walks. On a day like today, for instance, My FitBit has 80 active minutes registered for me, which is roughly the length of the two longer walks my dog and I took during the day. The Apple Watch; however, thinks that only 5 minutes of my movement today was something that qualified as “Exercise.” That’s a big difference. Truth be told, I’m walking at a fairly slow pace on these walks (likely an 18-19-minute mile), so I’m not really doing anything I’d consider strenuous exercise. It’s interesting that the two devices register the same movement in such dramatically different ways. This was something I’d obviously seen in the demo videos Apple put out, but I didn’t quite understand the usefulness of it until I started using the Watch everyday. 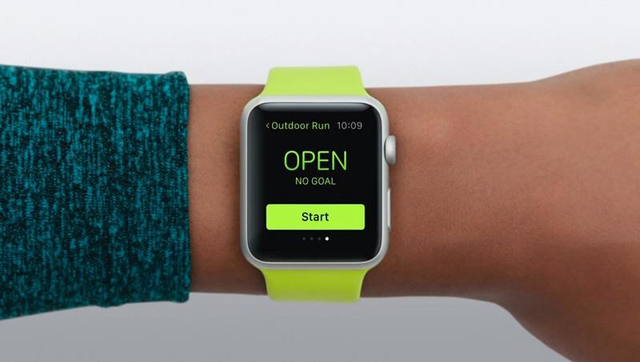 With the Apple Watch you can set a calorie goal each day, a number you intend to reach through movement. As the day progresses, the pink circle in the Activity app gradually closes. When I first set the Watch up, I picked 700 calories as my goal. As a fairly active person, it seemed like a reasonable goal to me. As it turns out, burning 700 calories takes a bit more effort than I thought, and I missed the goal more than I hit it that first week. What was interesting was the Apple Watch’s reaction to that failure. The following Monday it suggested a much lower calorie goal as something for me to try. I hit it every day that week, and then the following Monday the Watch suggested something slightly higher. Now a few months later, my daily goal has topped 800 and I’m hitting it every single day. The Apple Watch gradually scaled things up from week to week, making what was once an impossible goal now something I do on a normal basis. That’s a huge contrast from my FitBit. With that, I can set a step goals and see how far I am from achieving it, but it’s up to be as far as determining what’s realistic in terms of goals. As it turns out, my fitness goals are all fairly unrealistic, so I’ve really enjoyed having the Apple Watch gently push me along and make helpful suggestions on what I could conceivably accomplish. As a full-time writer, I spend the majority of my day glued to a computer screen. I’ve really enjoyed the gently reminder from the Watch to stand up during the day. When I first got the Watch, that notification was coming in every hour like clockwork. Now, I’ve trained myself to get up and move around during the day. I definitely feel a bit healthier and more productive during the work day because of it. Standing is also one of those goals that I missed fairly consistently the first few weeks I had the Watch, but now I reach my goal almost every day. One thing I miss with the Apple Watch is competition. With FitBit, old coworkers and I routinely have competitions where we try to outstep each other during the weekend or on a specific day. There’s currently no social element to Apple’s Activity app, so there’s no way for me to involve my friends in my workouts. I’d love the opportunity to challenge buddies using the Watch. There’s nothing like a friendly competition to motivate you to get out there and move!